In SalesAutopilot, actions perform all the database manipulating functions that are necessary for creating and operating complex systems. Subscribe to another list. This action adds the subscriber* to the list of your choice. Unsubscribe from target list. This action removes the subscriber from the target list, which is any list of your choice. Update details in target list. This action updates the existing details of a subscriber in the target list, which is any list of your choice. External action. The system invites another IT software and performs the desired action in that software. Create task. It creates a CRM task for the subscriber with the parameters of your choice. Create helpdesk ticket. It creates a helpdesk ticket for the subscriber with the parameters of your choice (e.g. with the information provided on a form). *Subscribers are identified by their email address. We will get back to how you can set up each one of these actions later. The subscriber is added to or is removed from a segment based on changes in some of their details, and thus they receive or no longer receive certain communications. The resulting change is considered to be a profile update, and therefore the system automatically sends the appropriate communications to the subscriber. This usually occurs along with the previous example. In other words, the communication related to profile update is sent only if a subscriber is or isn't in a particular segment. A date is added to the subscriber's details which has one or more relatively timed communication(s) assigned to it. 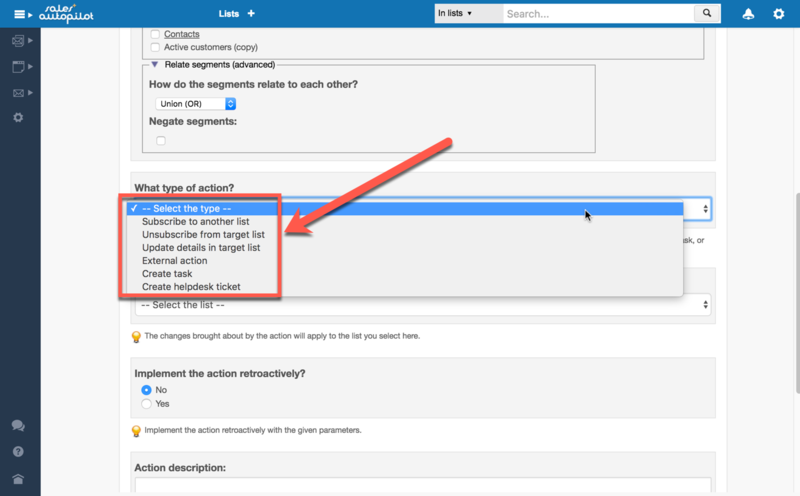 To create an action related to a given form, open the form, and go to the 'Actions' tab. Once you have opened the 'Actions' tab, click on the 'Add action' button. This will take you to the action settings page, where you can set every parameter of the action. Each of the settings are explained in detail below. Since the event that triggers a form-related action is always clicking on the 'Submit form' button, i.e. for a signup form it's subscription, for a profile update form it's the update, you don't have to (and actually can't) select the event that will trigger a given form-related action. This implies that all the settings on this page are related to the change that will be brought about by the action. For the source list, select the list that will be used by the action to acquire the necessary details for adding or updating details in the target list. By default, the source list is the list the form that triggered the action belongs to. However, the source list can be any one of your lists, not just the one the form belongs to. At the same time, we recommend that you don't change the default source list until you get comfortable with using actions. If there are segments in the source list, then here you can decide whether you want the action to apply to every subscriber of the source list or only to those subscribers who belong to a particular segment. 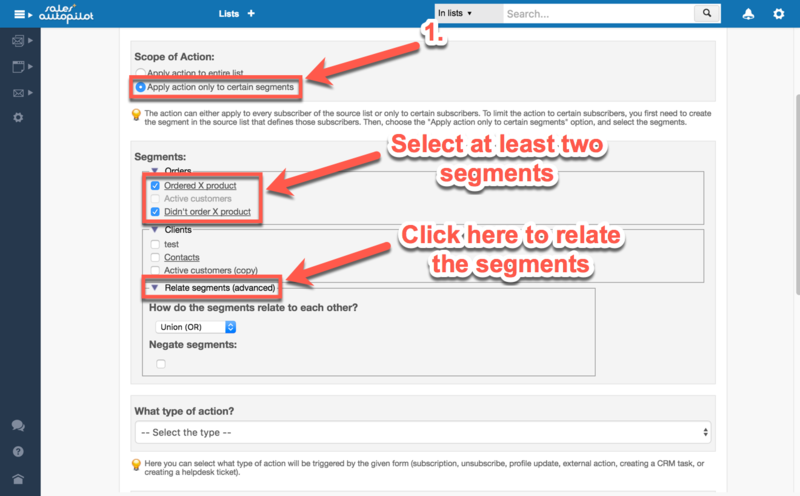 Once again, we recommend that you stick to the default setting (Apply action only to entire list) until you have a working knowledge with segments. An additional option is to relate two or more segments, as you would relate conditions for delivery schedules. Thus, you can have the action apply only to those subscribers who belong to several segments, all of your segments, etc. Subscribe to another list: This type of action adds the subscriber to a list other than the one they are subscribing to by filling out the form (or the one they are already subscribed to in the case of profile update forms). When the action has to add a subscriber to a "Classic" newsletter list (where an email address can only be added once) then the action will only add the subscriber to the list if they are not on it already. IMPORTANT #1: This type of action can only transfer those details of the subscriber from one list to another which are in exactly the same type of field in both lists (the field names have to match exactly). To transfer details which do not have corresponding fields in both lists, use an "Update details in target list" type of action. IMPORTANT #2: When you transfer order details from an order list to another list, then the ordered products are not transferred. Unsubscribe from target list: This type of action changes the status of an email address – as long as it's on the list - to unsubscribed. If the email address is not subscribed to the given list, nothing will happen. Set a specific value. In this case, the value you type in the right column will be transferred to the field of the target list selected in the left column. Set a logical value. This is almost the same as the previous option. The difference is that you don't have to type in the value, you just have to select the possible values of the field from a dropdown list (Unchecked / Checked). Transferring a logical value from one list to another. If in the left column you choose a field with a logical value, then in the right column you can either select the Unchecked / Checked values or a field with logical value. This will transfer the logical value of the field on the right (from the source list) to the field of the target list you selected on the left. Number of days passed between two events: This setting allows you to enter the number of days that have passed between two date fields, or between a fixed date and a date field, in the given field of the target list. To find out how many days have passed between two date fields, enter the following values in the right column: datediffdays([datefield1],[datefield2]) (where datefield1 is greater than datefield2). Or, if you would like to find out how many days have passed between a date field and a specific date, enter the following value in the right column: datediffdays([datefield],YYYY-MM-DD) (where datefield is greater than the second date). Make sure to enter the dates in the right order to avoid getting negative results. For example, if the value of the date field on the left is 06-31-2016 and the value of the field on the right is 06-01-2016, then the result would be 30. Increase or decrease the value of a field by a specific number. If you type +n or –n in the right column, where 'n' is any whole number, then the value of the field on the left (target list) will be increased or decreased by the value of 'n', respectively. The only condition for this type of action is that the field you select from the target list has to be a numerical field. Increase or decrease the value of a field by the value of another field. If you type +[field_name] or –[field_name] in the right column, where 'field_name' is the name of a numerical field of the source list (right column), then the value of the numerical field in the target list (left column) will be increased or decreased, respectively, by the value of the field in the source field. However, this type of action only works if the fields you select from the target list (left column) and from the source list (right column) are both numerical fields. One useful way of applying this action is to keep track of the total number of orders each subscriber of your newsletter list placed for a certain product. Then you could use this information to create segments for future campaigns. In such a scenario, you would enter the name of the field of your order list in the right column, and the name of the field that counts the total number ordered in your newsletter list in the left column. Thus, whenever a subscriber fills out an order form (which belongs to the order list), the quantity they order will be added to the field of the newsletter list that measures the total quantity they have ever ordered. Multiply value by a specific number. If you type *n in the source list field (right column), where 'n' is any whole number or decimal, then the value of the field in the target list (left column) will be multiplied by 'n'. The only condition for this action to work is that the field in the target list has to be a numerical field. Multiply value by another field's value. If you type *[field_name] in the source list field (right column), where 'field name' is the name of a numerical field in the source list, then the value of the field in the target list (left column) will be multiplied by the value of the field from the source list. The only condition for this action to work is that the field in the target list has to be numerical. Enter the sum, difference or product of two fields as the value of a field. If you type [numerical_field_1]+[numerical_field_2] or [numerical_field_1]-[numerical_field_2] or [numerical_field_1]*[numerical_field_2], where 'numerical_field_1' and 'numerical_field_2' are the names of numerical fields in the source list, then the value of the field in the target list will be the sum, the difference, or the product of the two fields, respectively. The only condition for this action to work is that the field in the target list has to be numerical. You can add or multiply as many fields as you want. Concatenating a text to the field. You have the option to concatenate a fixed text or the content of a field of the source list to a field in the target list. For this, you first have to select the field from the target list (left could), which either has to be a 'short text' or a 'textarea' type of field. Then, click on the [...] button on the right. If you would like to add a fixed text to the already existing text in a field, select the Concatenate string option under Modifying functions, and then click insert. The input field will then say: +"Concatenated text" Change the text between the quotation marks to the text you wish to concatenate. If you would like to add a field value, select Concatenate field value, then click on insert. Lastly, use the dropdown list to select the field (from the source list) you would like to concatenate to the field of the target list. Adding random text: e.g. "MKT"+random(5). This type of action adds a fixed text, and then a random text of desired length to the field in the target list. Syntax: "text"+random(number of random characters). The number of random characters determines how long of a random text (including numbers and letters) will be generated. If you don't want to have any text before the random text, leave the space between the quotation marks blank. Creating a task. If you are using the CRM module, then you have the option of setting up an action that automatically generates tasks for the contacts in your CRM list, and then assigns these tasks to the selected SalesAutopilot users. However, the action will only create a task for those subscribers who have the identical email address in your CRM list and the source list of the action. Name of task: the task will be generated with this name. CRM list: if you have more than one CRM list, select the one you would like to create the tasks for. Category: the category of the task. Event date: the deadline of the task, which determines its relevancy. You have two options. You either set a specific date, down to minutes and seconds, or you set how many days after the action the task will be due, and at what time of day (hour and minutes). Completed task (event): enabling this option will automatically generate a task with a completed status. Segments: the task will be created if a subscriber is in a selected segment, and it will only be relevant as long as they are in that segment. If they are removed from the segment, the task will no longer be on the list of relevant tasks. Description: the description of the task. The following three settings are all advanced techniques, so we recommend that you stick to the default settings when you first start using actions. NEVER overwrite a field's value with zero or no value This option is very useful when the target list may already contain the subscriber’s details affected by the action. For example, a subscriber may fill out the optional address field on the signup form that adds them to the list, but then at some point in the future, they may fill out another form and leave the address field blank. In such a case, you wouldn't want the action to overwrite the address they provided before with no value, and that’s exactly what this option allows you to do. Overwrite the field's value even with zero or no value This option is the exact opposite of the previous one. When you use it, the action will always overwrite the value of the field in the target list, even with null or no value. Thus, it will always have the value entered with the most recently run action. This option can be illustrated the following way: when you are organizing an event, let's say you create a profile update form where subscribers can cancel their participation at the event. In this case, when a subscriber fills out the profile update form, the action would overwrite the date field for the event in the target list with no value. Only if the value of the field is zero or no value: If you select this option, then the action will only overwrite the value of a field if it's empty or null. This is quite handy when a field's value needs to be entered once, and then permanently stay that way. For example, if you would like to save the date of subscribers' first purchase in your CRM list (e.g. to create a segment for long-term customers), then you wouldn't want the date of first purchase to be overwritten with every new purchase. This type of action will enter the date of purchase if the date of first purchase field is empty, but it won't overwrite it in the future. Implementing actions retroactively. If you choose to use this feature, then within a couple of hours after the event that triggers the action, the software will apply the action either to all of the former subscribers of the source list, or only to those subscribers who fill out the form the action is related to. You can choose between these two options. If you don't have a lot of experience using actions, it's better to make a backup of the target list before you activate an action which uses this feature. You can make a backup by using the Export feature. Perform action only after a successful credit card payment: This feature is only available for form-related actions when at least one of the shipping/payment methods offered on the form uses credit card payment. If you enable this feature, then the action will only be performed after successful credit card payments. 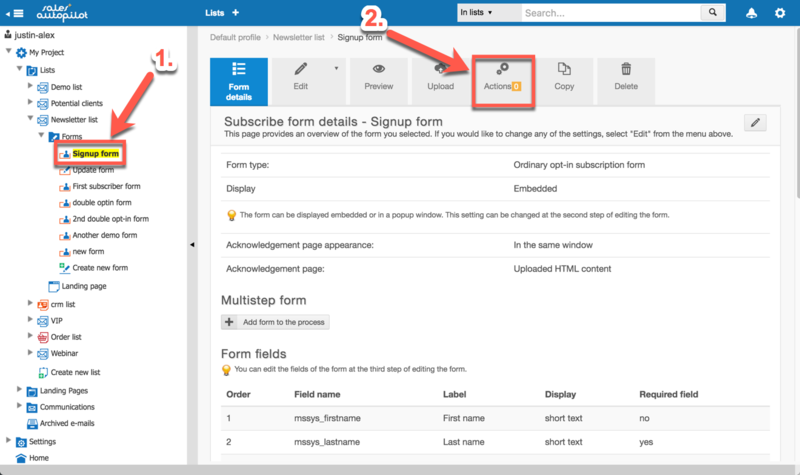 If you have to change the settings of an action that is related to a form which you have already embedded on one of your webpages, then you don't have to worry about having to embed your form all over again. You can find the actions related to a given email by going to the 'Actions' tab of the given email. Actions triggered by emails are not a whole lot different from actions triggered by forms, though there are two significant differences. 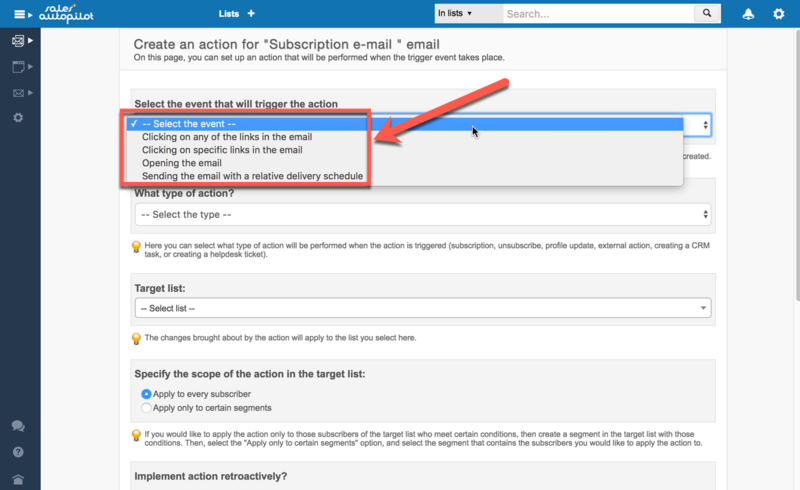 You can choose from 4 kinds of events that can trigger your email-related actions. Clicking on any link in the email. As the name implies, this action is performed when a recipient clicks on any of the links in a given email. This action doesn't work unless click-throughs are being monitored for the given email. Clicking on a specific link in the email. 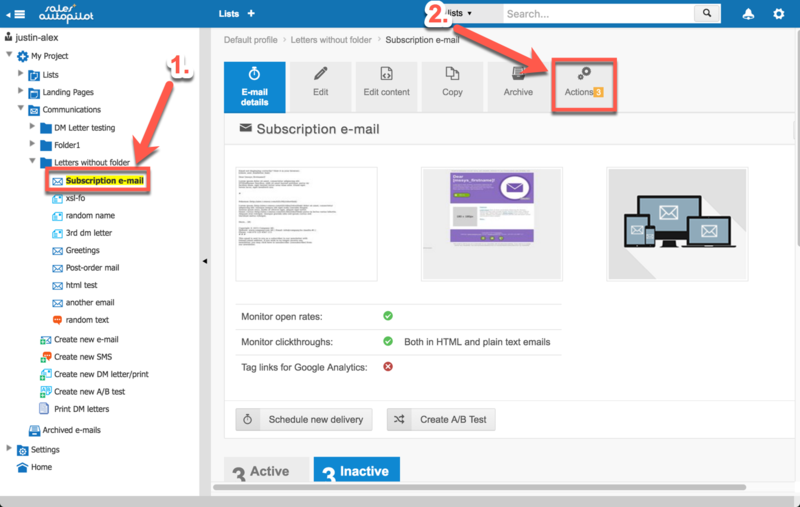 When you use this option, you will have to select which link(s) in the email will trigger the action. This type of action doesn't work without click-through monitoring either. Opening the email. This type of action will only be performed when the recipient opens the email. This action works only when the email contains the check open code ( [checkopen] ) AND when the recipient chooses to display the pictures in the email. For this very reason, we suggest that you use this option to supplement another click-through-related event. Sending an email with a relative delivery schedule: You can select this option when there is at least one relative delivery schedule assigned to a given email. The action will only apply to a particular subscriber if a given email is sent to them with a relative delivery schedule. This feature is particularly useful when the relative delivery schedule has a complex set of criteria, and you would like to time another event with respect to its delivery (e.g. sending another relative email). While form actions are performed almost immediately after the trigger event, email actions are first added to a so called waiting list, and are performed every 10-15 minutes. This feature ensures that subscribers notice no delay after click-throughs. When you are testing a given action, keep this in mind and don't expect to see the changes brought about by the action in the target list immediately. There might be cases when your actions have to be performed in a specific order. In such cases, go to the actions tab of a given email or form and use the mouse to drag-and-drop the actions in the right order. This new sequence will be saved automatically, so you won't have to worry about saving it manually.